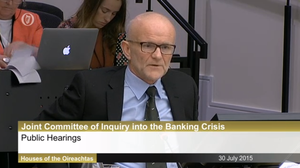 You’ may recall yesterday’s post containing the bulk of former CEO of Anglo Irish Bank David Drumm’s statement to the Banking Inquiry. 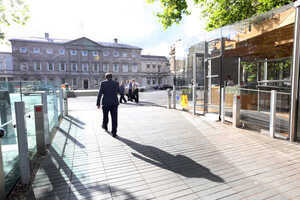 It came ahead of former non-executive director at Anglo Fintan Drury’s appearance at the inquiry this morning. Alan Dukes and Mike Aynsley are also scheduled to appear today before the inquiry takes a break for the summer. In his statement, Mr Drumm claimed Mr Drury acted as an intermediary between Anglo Irish Bank and Brian Cowen. Mr Drumm also claimed, “In April 2008 the Board of AIBC held a private dinner with Mr. Brian Cowen, TD, then the Minister for Finance and Taoiseach elect. I sat next to the Minister and it was the first opportunity I’d had to speak with him privately. 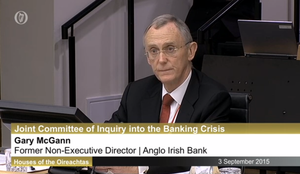 We discussed the difficulties in the financial markets at that time” contradicting what Mr Cowen told the Banking Inquiry recently. Mr Drury’s appearance was to begin at 9.30am this morning but it has been delayed. 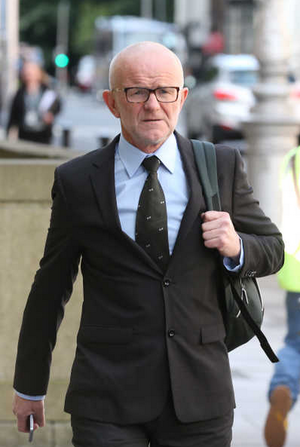 Mr Drury, a college friend of former Taoiseach Brian Cowen and whose corporate communications consultancy company Drury Communications advised Anglo, was a non-executive director at Anglo Irish Bank from 2002 until 2008. He founded Drury Communications in 1988 and retired from it in 1999. He was also an RTÉ reporter in the 1980s and presented Morning Ireland. He was chairman of the RTÉ Authority from mid-2005 until his resignation in January 2007. Ciaran Hancock, of the Irish Times, spoke with Keelin Shanley this morning in light of the delay in this morning’s proceedings. 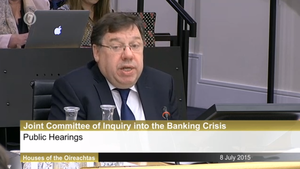 Posted in Misc and tagged Banking Inquiry, Brian Cowen, David Drumm, Fintan Drury at 1:02 pm on July 30, 2015 by Broadsheet. I think he was on Grand Designs last night building a house out of shipping containers…. Is Fintan Drury the same guy from Sin City? That’s the real crime here, folks.